What should you know about hair oil treatment? Do you know what hair porosity is and what porosity has your hair? What makes it stand out? Hair mask in form of pure oil. Recommended for frizzy and dry hair. The Rose Oil is a part of an exceptional BC Oil Miracle Line. Used on regular basis helps get rid of damaged hair effect. It ensures softness and tames unruly hair. Its cost is affordable, especially in comparison to the competition. The hair oil with an interesting design. Plastic, handy and light bottle with 100 ml capacity has a shape of a drop – it is wider in the lower part and gets more narrow towards the upper part. The entire thing is kept in colour of pink. 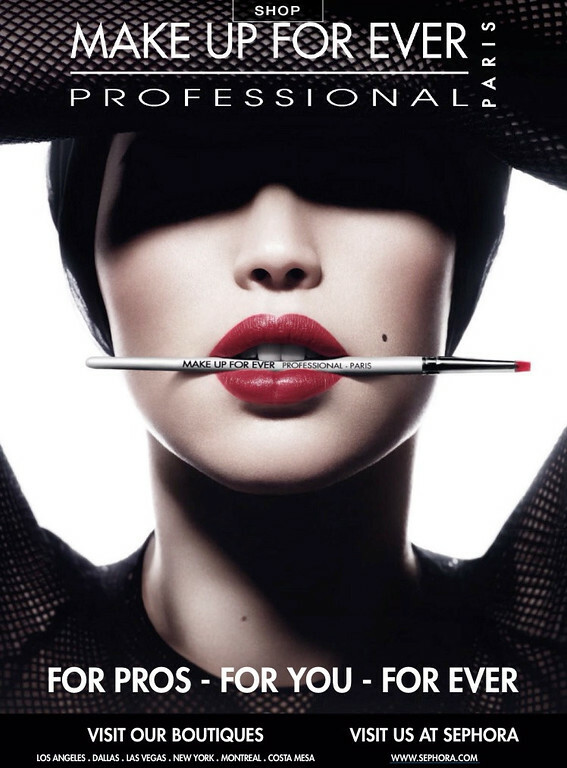 BC Oil Miracle Rose Oil is colourless, watery and feather-light. Its fragrance is beautiful and intense rose aroma. The application may be difficult due to lack of applicator. The plastic cap with small hole is not a too practical solution for the product of this type. BC Oil Miracle Rose Oil absorbs great. It is an alternative for the heavy hair masks because it is easier in use. It leaves hair soft and light. The Rose Oil applied on dry hair can weigh it down in spite of the feather-light formula. However, combing is significantly facilitated. What does Oil Miracle Rose Oil contain? 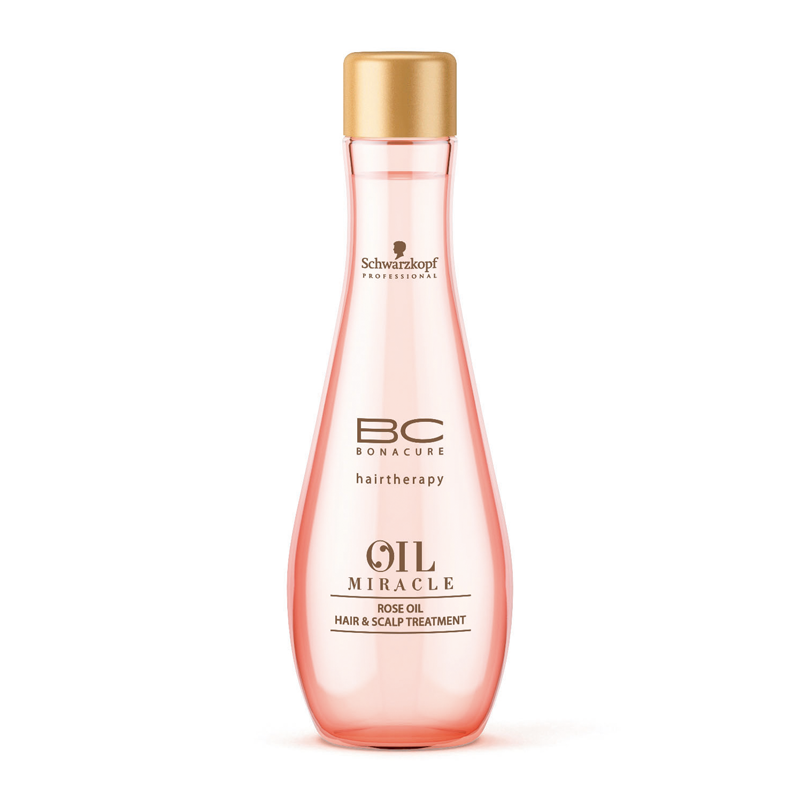 Schwarzkopf BC Bonacure Oil Miracle Rose Oil is a hair oil with two precious ingredients – wild rose oil for moisture restoration and high-quality Rosa Damascena flower oil. Beside it, BC Bonacure Rose Oil consists of apricot kernel oil rich in essential vitamins. Nonetheless, the product contains some gentle silicone, easy to wash down, but disqualify this product as suitable on the scalp. Especially, that in the composition is very harmful alcohol that can irritate skin. 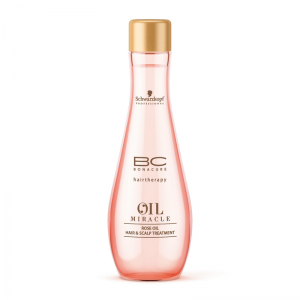 BC Oil Miracle Rose Oil is worth the attention if not for the last components.